Book by book and poetry reading by poetry reading, Ken Sanders has turned his 17-year-old downtown bookstore into one of Salt Lake City's artistic anchors. Sanders says that during this time, he's watched every storefront—with the exception of a tire shop and a dry cleaner—on east Broadway flip from business to business as downtown has tried to re-create the vibrancy of other big cities. Now, out of the recession, with the shadows of cranes arcing across the city's fat streets, the sound of jackhammers in the air, and hip boutiques and bars emerging out of formerly derelict buildings, downtown is at last having its day. Sanders, 62, has weathered the years to see people once again flooding downtown. But high on his to-do list is shepherding his business—now six employees strong and standing on solid financial ground, he says—to another location to make way for a new development that could spring from his rented space in the next three to four years. The white brick building at 268 S. 200 East that houses Ken Sanders Rare Books, and the row of businesses anchored by The Green Ant furniture store that stretches from the north corner of 200 East and 300 South to Edison Street, were recently leased by Ivory Homes, one of Utah's largest house and apartment builders. Sanders says his new landlord has told him he's got at least three years at his current location—maybe many more, depending on the economy, Ivory Home officials say. Far from bitter, Sanders says that building his business has been contingent on receiving below-market rent for the past 17 years—a reality he suspected wouldn't last forever. "I've known this day would come," he says. "I'm grateful for the 17 years we've had here because we've just stumbled into a really sweetheart deal." 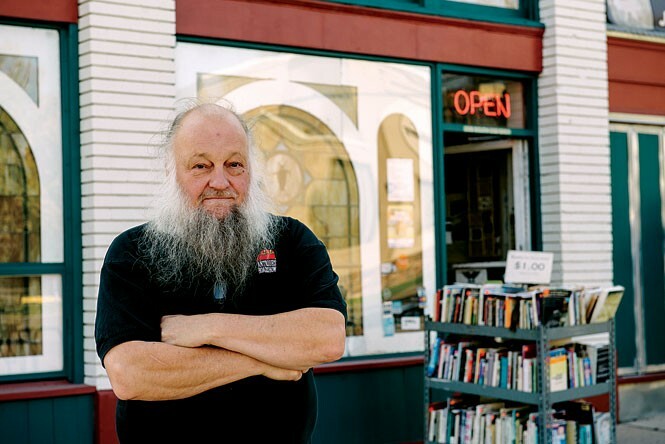 But he hasn't missed the incongruity of the idea that he'll soon be moving the tens of thousands of books he's spent years piling high in his shop while playing an oversize role in making east Broadway the cool, eclectic place it is today. Sanders' bookstore and other retail shops are pictured in the 35-page pamphlet for a $39 million, 189-unit residential development called Edison Quarter, which will be located on Edison Street (between State Street and 200 East). The promotional materials call the area's businesses "nothing shy of unique, creative and authentic." Of Sanders' store, it says, "This bookshop is as authentic as it gets!" "I think there's a certain irony there," Sanders says, noting that with commercial real estate going for north of $20 a square foot, he's unlikely to find a downtown location. "I guess by surviving long enough, we've somehow become some sort of iconic institution." Salt Lake City Councilman Luke Garrott, whose district includes the east Broadway neighborhood, says he was "flabbergasted" to hear that Sanders' bookstore and the other nearby businesses were threatened. But, Garrott says, without owning their buildings, business owners like Sanders will always be a target for developers. And if zoning ordinances allow for larger development on lots currently occupied by squat mason buildings with leasing tenants, Garrott said the scenario is a "ticking time bomb." "If you're not careful with the existing neighborhood fabrics, you might destroy the neighborhoods that make our city unique and attractive," he says. "That irony is cruel, and it should be unacceptable." Aside from attempting to keep a tight grip on zoning, Garrott says there's little the city can do to deter developers from developing. One avenue Garrott would like to explore is creating a loan program to help small-business owners buy their buildings. In 2013, Salt Lake City's office of economic development issued just over $1 million in loans to small businesses. The largest loan was for $250,000. Garrott says any fund aimed at helping businesses achieve property ownership would have to be substantially larger, with loans in the millions. Stuart Clason, director of the city's department of economic development, says he, too, would like to see this sort of fund materialize. "We're trying to create something so that there's a larger pool of funding in the million to $2 million range," he says. Any such fund will be too late for Sanders, who's never owned the bookshop's building. But he greets the prospect of relocating with an air of inevitability and perhaps relief—the building, he says, is achingly hot in summer and so cold in winter that his employees must wear mittens while restocking shelves. In mid-July, Sanders sent a newsletter to his patrons informing them that he was looking for new space—4,000 to 6,000 square feet, and preferably below the climbing commercial rates. The newsletter, he says, was not meant to irk his new landlord or fuel speculation, but to squash rumors that he was going out of business. "Don't be alarmed by this news; the bookshop is healthy and thriving," Sanders wrote. "In many ways, a new homewillenable us to go forward to the next generation." The fate facing Sanders and his neighbors is likely just a prelude to what's to come for the city's downtown district. In its 2013 report on the state of downtown, the Salt Lake City Downtown Alliance highlighted downtown's record retail sales, which topped $800 million, and gloated over four residential developments that will add 460 new apartments, two new hotels and three new office towers, the largest of which will climb 24 stories into the sky. No plans have been submitted for the property where Sanders' store currently resides, but Chris Gamvroulas, president of Ivory Development, says it was the "funkiness" of Sanders' store and the other businesses there that attracted his company to the lot. Gamvroulas says he plans to be sensitive to the businesses' needs when plans do move forward for a development, which he anticipates will have a residential component. To that end, he says, he's met with the tenants, and favorable rents have been stipulated in two- to three year lease agreements to ensure they can keep their doors open. Gamvroulas says it may well be that the buildings currently occupying the lot are torn down, and that some businesses may be forced to relocate. But other businesses will occupy the new development, just as something else once occupied the building that currently houses Sanders' books and The Green Ant's furniture. This cyclical process, Gamvroulas says, is the nature of a living city. "Just because something moves there doesn't mean everything has to be static for them," Gamvroulas says. "Life isn't static, and cities aren't static; something went away for them to create their opportunity."